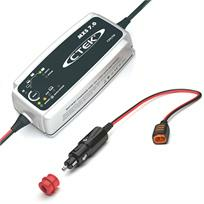 CTEK MXS 7.0 12V Battery Charger & Cigarette Lighter Adapter Kit. In standard operation, the MXS 7.0 constantly monitors the battery after it has been initially charged and only 'trickle charges' the battery when the voltage drops below 95%. This eliminates the danger of overcharging and allows the MXS 7.0 to be safely connected for months at a time. For car batteries, the MXS 7.0 will charge in half the time of the MXS 3.6. In addition, the 12v supply setting is a feature unique to the MXS 7.0 and can be used as a substitute for battery power as required - i.e. it can be connected to a vehicle to avoid losing security codes or ECU settings when the battery is removed. The MXS 7.0 is perfect for use on caravans and motor-homes that have several batteries in use together. It can be left connected to the battery and will 'top up' the charge whenever power is not being drawn by appliances. If faster charging is required, the more powerful MXS 25 charges in approx a third of the time of the MXS 7.0 for a similar battery size.